Originally from San Diego, California, Eric learned to rock climb in Joshua Tree National Park and surrounding areas of southern California. After ten years of teaching outdoor education, Eric has made a career of traveling, guiding and teaching in the wilderness. He currently lives in Seattle, Washington where he works for Alpine Ascents. Eric guides in Alaska, Argentina, and in the North Cascades, and spends his free time climbing and snowboarding in the Cascades. 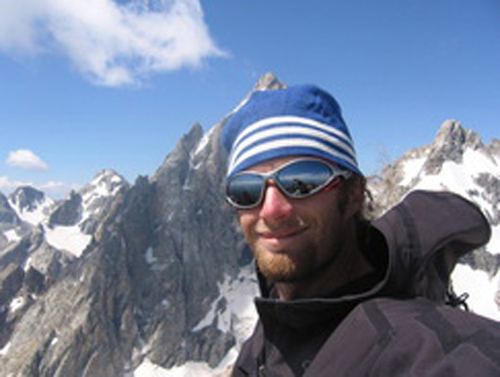 Eric has worked for several guide services and outdoor education companies, but now works for Alpine Ascents full time. Some of Eric’s favorite climbing areas include Alaska, the Tetons, Red Rocks, and Joshua Tree. When not guiding, Eric is in the mountains climbing with his buddies, traveling, or fly fishing. Eric loves guiding because he gets to share his passion for the mountains. First ascent, of Crown Mountain (18,373 feet), Shaluli Shan range. Western Sichuan, China.